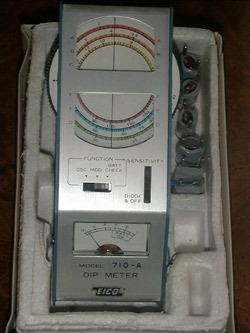 The EICO 710 GDO was one of the more successful tube-type, AC line powered, GDOs. 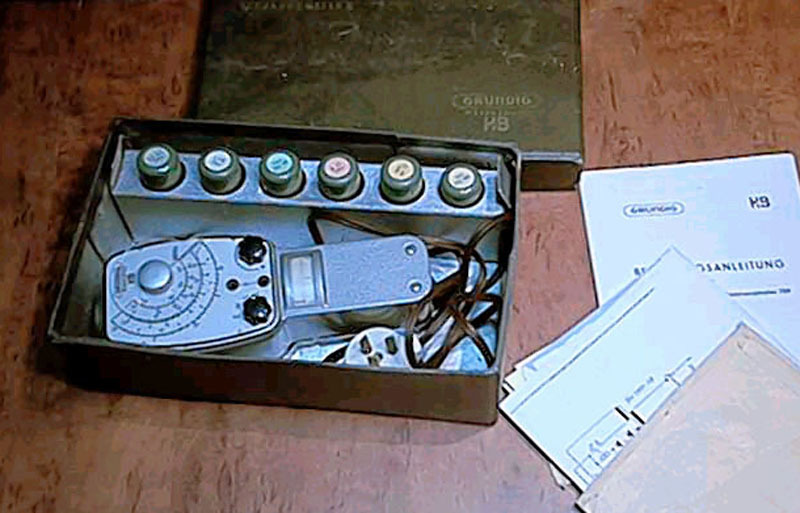 It had a frequency range of 400kHz-250MHz in 8 overlapping ranges. Even though it was a kit, it-as with all other KIT GDOs I am aware of-used pre-wound plug-in coils wound to a 0.5% accuracy on polystyrene forms. 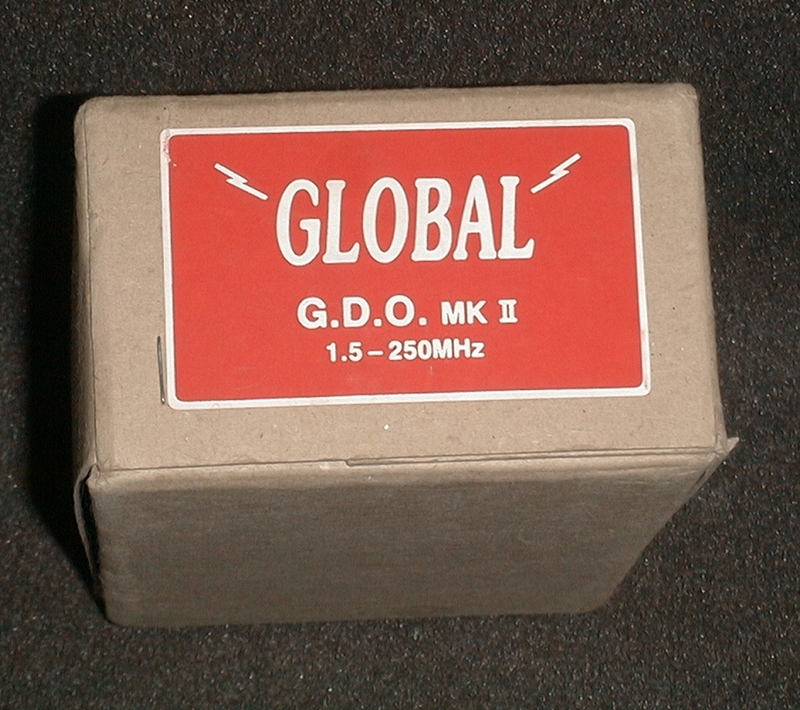 A GDO is basically a wide-range oscillator with a meter in the grid-return line to indicate when the resonant frequency (of the tuned circuit it is loosely coupled to) matches the frequency of the GDO oscillator. That happens because the tuned circuit-under-test absorbs the energy of the oscillator, causing the "dip" of the meter needle downwards. If that oscillator is reasonably calibrated, you then know the approximate resonant frequency of your coil-capacitor combination. The EICO 710 GDO uses a 1:7 planetary drive on the tuning capacitor. It uses a 6AF4A in a Colpitts oscillator circuit. It is transformer-operated, and uses about 10W of power. The rectifier is a selenium , and I would strongly recommend: 1) measuring the DC voltage at its output; 2) and then exchanging it for a suitable silicon diode. You should then 3) insert an appropriate dropping resistor to cut the voltage back down to its original value. Measurements for the EICO 710 GDO are: 2.25" high; 2.6" wide; & 6.9" long. It weighs approximately 3 lbs. The exterior is Steel and Grey wrinkle finish. 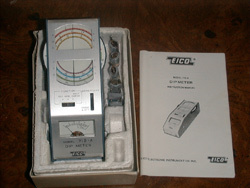 The EICO 710-A GDO is a private-labeled solid-state unit identical to the Leader LDM-815 and the Loadstar KDM-6. I had never seen or heard of one 'til I found this one on ebay. 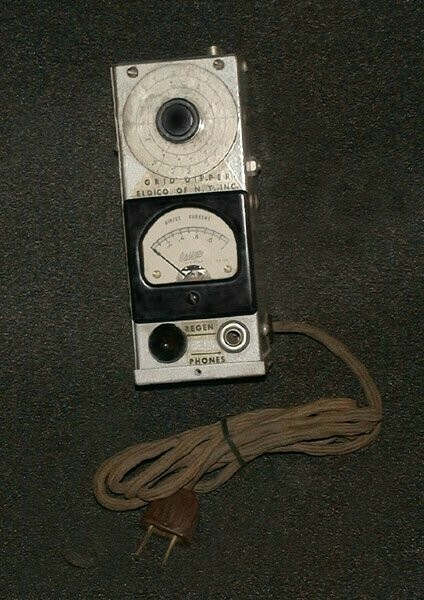 I have finally obtained a nice Eldico GDO with coils or info; and a very good condition Eldico AntennaScope. The GDO is at right. I was fortunate enough to obtain one from the original owner-builder... complete with assembly manual. I will be scanning the manual for BAMA as soon as I can. The photo at right is NOT the 'new' one. The GLOBAL G.D.O. Mk II is another example of the private-labeled Loadstar/NOVEX modern GDO line manufactured in Taiwan. 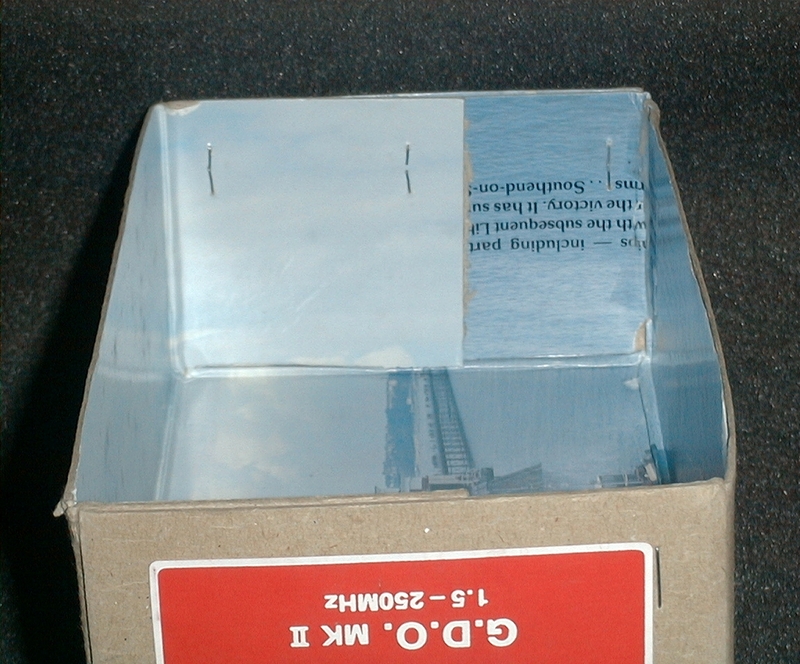 This one came from England, and an interesting thing about it is its box. I gather these GDOs come, OEM-style, in a molded polyurethane foam box/container. Apparently without a cardboard outer box. Reason for this supposition can be seen in the pictures below. 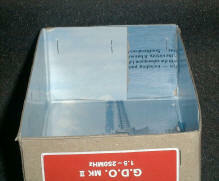 While the GLOBAL box label is firmly affixed, as you would expect from any commercially-made product, the box itself can be seen to have been (very well) made from salvaged/surplus cardboard. Look at the printing on the inside. This unit has seen little or no use, and it was probably the original 9V battery I removed upon arrival. a Grundig HZ Type 701 GDO in very good to excellent condition. Acquired recently from Australia! 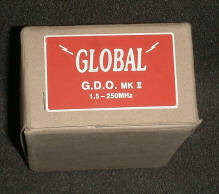 I have all Heath GDOs including: the Models GD-1, GD-1A, and the GD-1B. Deserving special mention is the Heath GD1-B (1955) Special LF Version GDO, his very rare GDO is in absolutely MINT condition; with: original shipping box, instruction sheet, conversion scale, and Auxiliary Coil Set 341-A for ranges: 300kc-700kc and 700kc-1.9Mc (it'd be a shame to use Hertz here, wouldn't it! ); The optional LF coils and chart cost $3.00 in 1954!!. 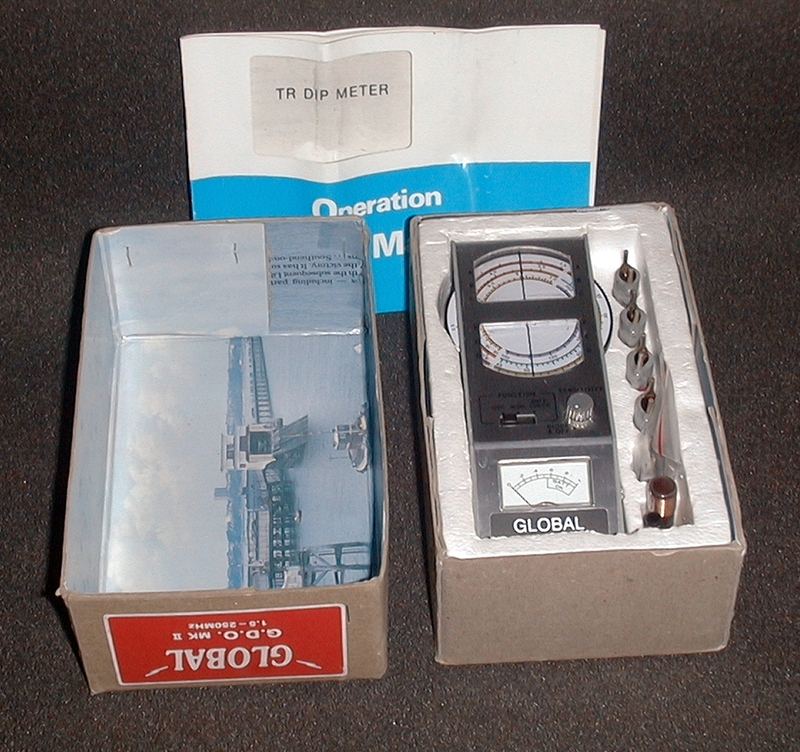 The associated GD-1B was $19.50. 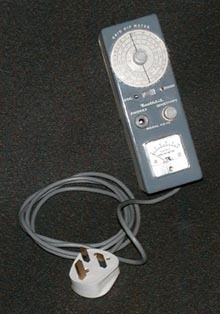 I also have the HM-10A Tunnel Dipper: one of the few (if not the only) commercial Amateur Radio applications of the tunnel diode. Also included in my collection is an assembled (by me) HD-1250 MOSFET GDO; and an unopened, still-sealed-in-the-box HD-1250 kit. 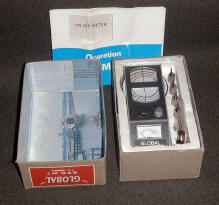 I also have two models of the European version of the Heath GD-1, the GD-1U's. One-as seen at left-that is a medium grey, with white letters. The other is a lighter grey, with dark letters. I believe this is the older unit. These are 220V European-only models I got from England. Very similar to the U.S. GD-Series, but a nicer design. Notice the EURO 220 VAC plug.